Housing minister Brandon Lewis said the government aimed to see one million new homes in England over this Parliament. 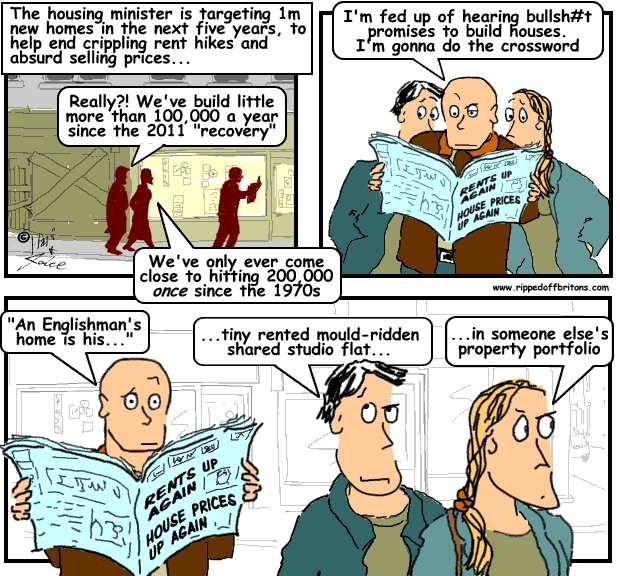 But the National Housing Federation (NHF) said about 245,000 new homes were needed each year in England. Figures from 326 councils showed only 457,490 were built between 2011 and 2014. The NHF estimated 974,000 homes were needed during that period. Gill Payne, NHF director of policy and external affairs, said: "Skyrocketing rents and ballooning house prices are eating up more and more of people's wages and forcing people out of their local communities or into smaller, lower quality housing... We haven't built enough homes in this country for decades.” In 2012, the government introduced changes to the National Planning Policy Framework, aimed at making the planning process simpler and quicker. But numerous other factors have also been blamed. A shortage of land has also been cited by homelessness charity Shelter, while criticism has been levelled at developers who build slowly rather than progressing quickly. By keeping the number of new homes available at any one time low, the price of those houses can be kept high, said Matthew Pointon, property economist at Capital Economics. A shortage of skilled labour, a big drop in the number of councils building new homes and regulations restricting housing associations have also been blamed. Shelter's chief executive Campbell Robb added: "We are past the time for another grand statement of ambition. To give ordinary families back the hope of a stable home, we need to see investment and a comprehensive plan that can actually get these homes built."